Cuyahoga Valley National Park in Ohio is not one of the “big name” US National Parks, but it certainly does have some beautiful fall colors. I spent a weekend in Cuyahoa Valley National Parks during the tail end of the autumn foliage and did some hiking out to see its waterfalls and do as much leaf peeping as I could. The park itself is rather unassuming. There is no defining or awe-inspiring geographical feature, and although there are a few waterfalls, a railroad, and the Everett Covered Bridge in the park, there’s really nothing all that distinctive about it. On paper, it pales in comparison to the National Parks in the American West. Or so I thought until I moved to “the American West.” You see, my first and only visit to Cuyahoga Valley National Park occurred approximately two years ago, when I made a weekend trip there from Indiana. I’ll admit that I was fairly unimpressed at the time. It lacked the grandeur of places like Yosemite National Park or other mountainous parks of the West–parks I longed to visit and explore at the time. Honestly, my impression at the time was that, while it had its own beauty, it was as if it was made a National Park because someone in Ohio had some pull (the “National Park” branding is strong marketing as compared to “State Park” and means an instant boost in attendance) or because the National Park Service felt there were a disproportionate number of National Parks on the West Coast. I put off writing this post after getting back from the trip because winter spread over the Midwest shortly thereafter, and something about the fall colors didn’t seem topical with snow on the ground. The idea for picking up the post returned to me as I found myself, somewhat ironically, longing for those fall colors of the Midwest, and thinking back to that visit to Cuyahoga Valley National Park. As for my visit, it was somewhat impulsive. I had visited Acadia National Park and Great Smoky Mountains National Park the two previous weeks during the peak of their leaf peeping seasons, and had great times at both of those parks. I was thirsty for more peeping action. (That sentence is either really dirty or really dorky depending upon your perspective.) 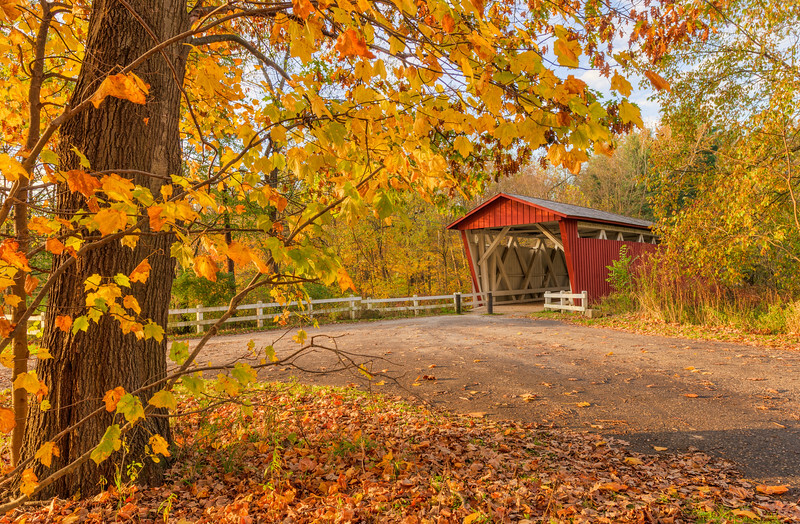 I read some reports from Cuyahoga Valley, and it sounded like some waning fall color remained. After work one Friday, I jumped in my car and didn’t stop until I was at Silver Springs Campground (one of the only ones open after mid-October…which was bizarre since Ohio has a strong leaf peeping game, and this could be prime season if they marketed themselves as such). I set up my tent in the dark, and crashed for a few hours before heading out to Beaver Marsh for sunrise. 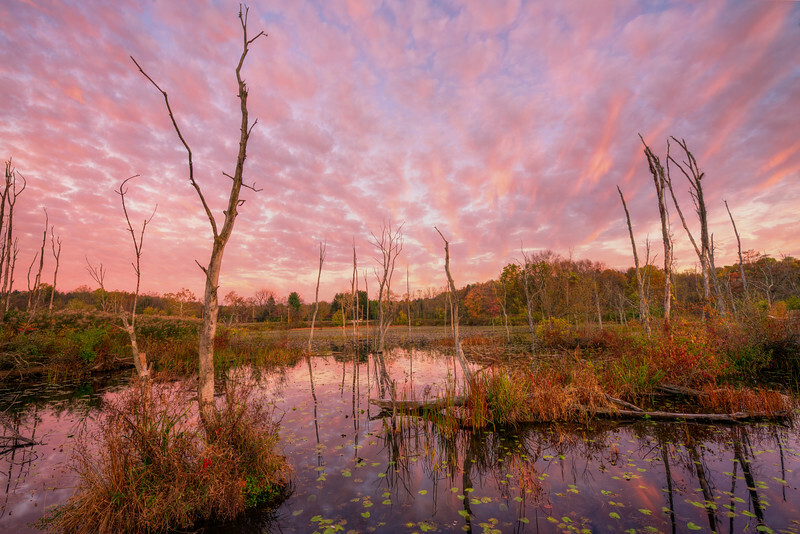 I don’t know what I was expecting of a marsh at sunrise–perhaps a killer action shot of a beaver annihilating some trees with a fiery sky behind the voracious beast–but it was a mundane, beaverless scene. Well, except for the sky, which was alive with color. Once I realized that the marsh’s name was blatant false advertising (perhaps it’s BYOB? ), I high-tailed it to my backup location, Everett Covered Bridge. This was a far more photogenic location, and the spot I’d recommend to photographers. I was also surprised by the number of joggers, especially for this unseasonably frigid morning. 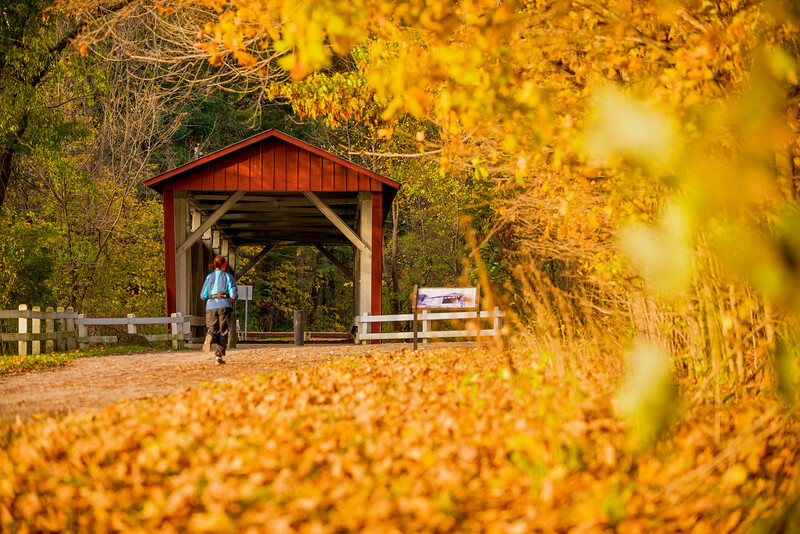 Jogging, walking, and cycling all appeared to be popular activities in Cuyahoga Valley National Park. I wouldn’t exactly call the urban areas between Akron and Cleveland that abut Cuyahoga to be bustling metropolises, but it’s clear that the locals treat this their city park, of sorts. I could see why, as the trails were nice, offering scenery that easily put city parks to shame. 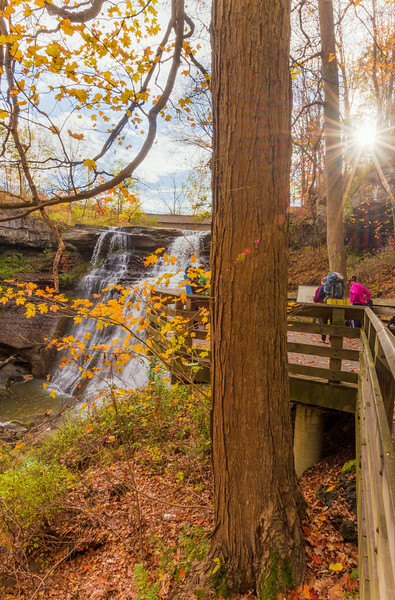 I also made my way to other, easier to find spots for which Cuyahoga Valley National Park is known, such as Blue Hen Falls and Brandywine Falls, just to name a couple of places. I can certainly cover tips & info about these spots in a future post (it only took me 2 years to write this one, so expect a follow-up in early 2021), but the point of this post is more to reminisce about a park that has aged in my mind like a fine wine, as I pine for the glow of those warm fall colors that I once took for granted. In the end, no place should simply be reduced to its highlight reel of top spots, and when viewed as a whole, Cuyahoga National Park is actually a charming little park. It may not have iconic peaks, majestic wildlife, or a jagged coastline, but it does have its own unique offerings. This is especially true in fall, when the leaves turn a spectrum of different colors, and the hiking trails around the park are awash with these colors. That’s the thing about the National Parks–they all bring something special to the table, and that isn’t always going to be epic in nature. Sometimes, it’s “simply” a breeding site for birds once on the verge of distinction, like Pinnacles National Park. Other times, it’s a respite from the cities of the Midwest, that showcases the natural beauty of those areas of the country. The National Parks aren’t solely highlight reels of the geography of the United States. They also offer a survey of the natural diversity that makes this country so great. It took me a while to realize that, but I finally did, and in the process, I grew a greater appreciation for Cuyahoga Valley National Park. Now, I yearn for a chance to get back to my roots in the Midwest, and to revisit this National Park that I once dismissed, as there’s unquestionable beauty in Cuyahoga, even if it doesn’t manifest itself in iconic mountains. 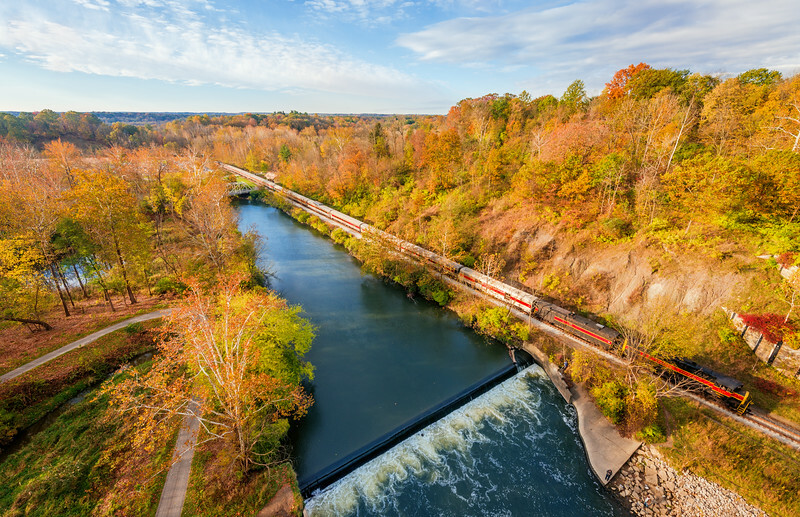 I hope this post has inspired those of you living in the Midwest–or visiting the Midwest–to take the opportunity to appreciate what Cuyahoga Valley National Park has to offer. 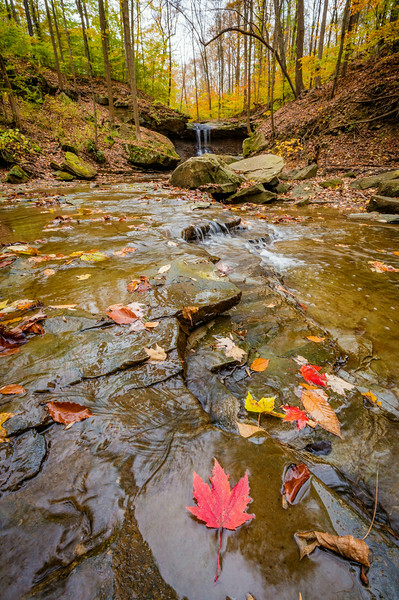 To get some more Cuyahoga Valley National Park photo ideas, check out my Cuyahoga Valley National Park Photo Gallery. For photo licensing inquires, please contact me. 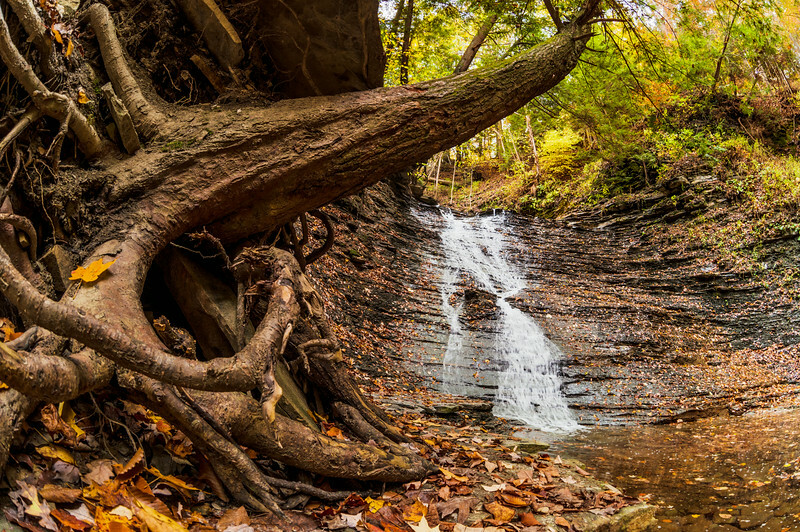 Are you a fan of Cuyahoga Valley National Park? If so, where are your favorite places and things to do in CVNP? Do you agree that each National Park brings something special to the table, or was I right in my initial assessment? Any questions? Share any thoughts you have in the comments! Very nice pictures – you managed to make a swamp look good. Leaving in Ohio, I never really understood why this rated “National Park” status either. It’s not a bad place, by any means, but it does have a hard time standing up to the big names. I think Hocking Hills state park is a nicer area in Ohio. I’d love to know the actual story, but I assume it *has* to be some politician’s pet project. Most National Park’s are in poor locations relative to major cities (for obvious, understandable reasons), so it’s a nice change of pace in that regard, I guess. It has definitely grown on me, but it still doesn’t compete with many of my favorites. I’m pretty sure I’ve been to Hocking Hills at some point (when I was younger), but I don’t have even the vaguest recollection of it. I’m sure that in order for the bill to pass and be signed by a reluctant president, some wheeling and dealing was done. I used to live in the next town over – when Cuyahoga was still a state park. We celebrated Earth Day there every year and went to the Farmers Market there. We have friends who live there – quite literally – their house is inside the park. And we attended a wedding in Peninsula this past summer. I LOVE Cuyahoga Valley National Park! And your photographs capture it’s unassuming (perfect description by the way) beauty. Did you capture any photos of the train? That’s a huge draw for visitors to the park. Enjoyed seeing your photos! I always find it interesting to see National Parks that include private land (Acadia is another good example of this). There’s an aerial photo of the train in this post. Or do you mean actually inside of the train? I didn’t have a chance to ride it. The pictures were worth the wait! I LOVE having four seasons and appreciate what each one brings to life. By the time I’m fed up with summer or winter, a change is around the corner. Fall colors are fleeting, which I think makes them all the more cherished. Similar to a sunset, you only have a short window to enjoy.